Art has been a defining characteristic of the human condition since the dawn of civilization. For millions of years, artistic expression has allowed us to reconstruct history and to picture the lives of those who once lived. It is through art that we can project ourselves into future worlds of imagination or recreate past worlds where our ancestors only dreamt of the present time. Art is a refuge and escape, therapy and exploration, as well as a subject that we engage students in early on at Chesapeake Montessori school. Like art, music is also an extension of the mind, body, and spirit, as well as an integral part of education as a whole. Dr. Maria Montessori believed that children between the ages of 2-6 most benefited from music education, as this window represents a time when children are most pliable and receptive to learning, transitioning from nonverbal to verbal communication. This period is also when brain growth and development is at a premium. Music plays a key role in stimulating areas of the brain that house interpretation and expression. As an advocate and proponent of sensory learning, Dr. Montessori believed that arts and music education should be a keystone of children’s overall education. Through singing and vocalization, children learn to use their ‘inner instrument’, or their voice, to make beautiful sounds. Through musical activities, children learn to listen both creatively and critically, making distinctions between tones, pitches, and keys that later move from abstract to concrete meaning. At Chesapeake Montessori School, we have two incredible education specialists that work with students primarily in these areas. 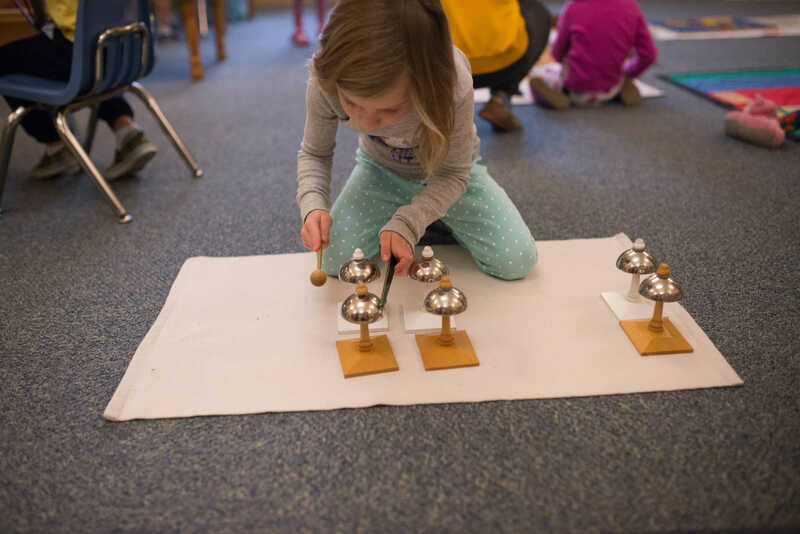 We’ve asked Amy Asel, our music teacher, and Donna Wooley, our art teacher, to share more about these subjects and walk us through what and how children learn in the Montessori classroom. From the very beginning of a child’s educational journey in the Montessori classroom, art is present. We see children in the art studio once per week in a group setting, for about 45 minutes. 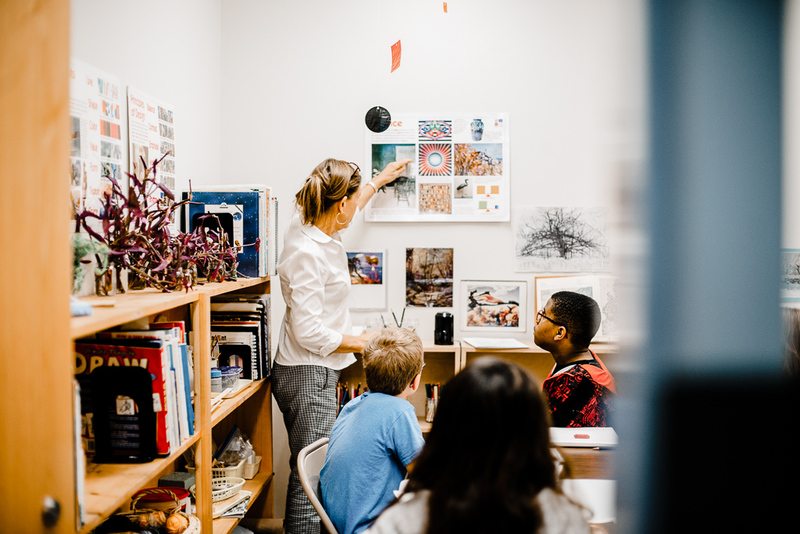 Lessons are given on a one-on-one or small group basis, and once a month, all students at the elementary level experience an age appropriate group lesson, critique, or history appreciation session. In Preschool, activities are designed for open-ended exploration and process over product. We strive to help children naturally gravitate to that which they’re most interested in, so that they may exercise their exploration and creativity without confines. Preschool activities are aimed at supporting brain development, including fine motor skills and communicating feelings either verbally or nonverbally. 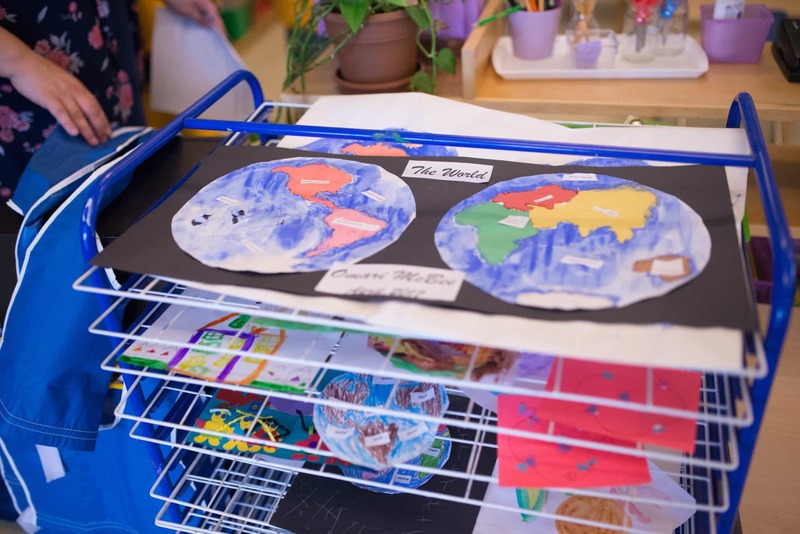 In Children’s House, the Montessori classroom accommodates an art area with inviting activities designed to train both hand and eye coordination. Later in Lower and Upper Elementary levels, children are invited to visit the studio during open art times, when their classroom work is caught up and there are no group sessions. Children are asked to visit six key areas of the room throughout the year: drawing, painting, sculpture, collage, and crafts. A large variety of different media and mediums are available in each area, and children choose when they would like to work in that area and what they would like to create. This corresponds with Dr. Montessori’s philosophy on “free choice”, the highest of all mental processes where children are empowered to exercise their decision-making skills and become intuitive to their unique preferences and needs. As with all subjects at Montessori school, open dialogue between parents and teachers is encouraged. We are happy to share further ideas or activities with parents eager to help children expand on what they learn in the art studio. 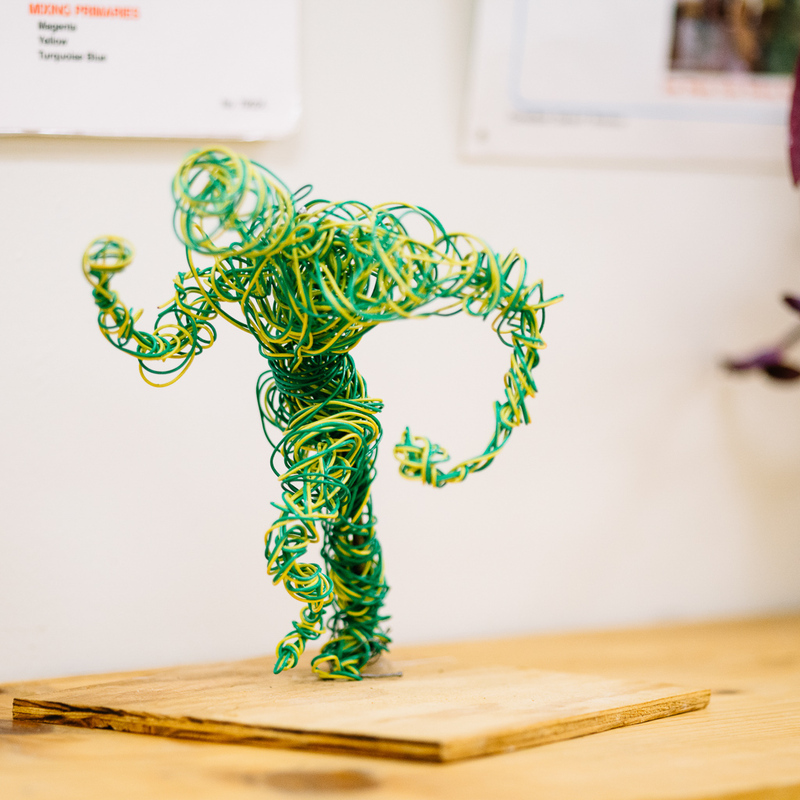 Our grading system for art looks at children’s character, effort, and use of learned knowledge – not critique or grading of projects. Instead, we put all student projects on proud display! From an early age, music is introduced to children early and often. We often see students once per week in group settings, for 20-45 minutes. In Preschool, we focus most on expression and engagement, encouraging children to sing, dance, chant, play instruments and play musical games through teacher demonstrations and individual work. As students graduate to Children’s House, teachers use pitched bells and tone bars to teach various concepts, such as loudness and softness, low and high notes, and matching pitch by humming along with a certain note. In Lower and Upper Elementary, we give more context to the sounds that they’ve already grown familiar with, exploring the physics of music and sound, as well as music history. We also discuss vocabulary, so children are able to properly discuss tone, pitch, melody, tempo and rhythm, while aware of their definitions and distinctions. We always encourage students to bring in their own music or questions about music at the beginning of class. It’s amazing the direction that some of these discussions take after children lead the way with their musical interests! We also encourage parents to engage their children in musical ways, whether through extra time spent listening to music at home or taking music lessons. At school, we can give a great foundation for music in the classroom setting, but one-on-one lessons provide an even greater in-depth study and opportunity to students who naturally seek to expand their knowledge. When it comes to grading, our teachers welcome dialogue with parents through in person, email, or open house communication. Because music is an ever-evolving process that can never be fully ‘mastered’ or ‘completed’, it can sometimes be a challenge to give grades. However, I do give out grades in Lower and Upper Elementary classes, based on participation and mastery of concepts. We are lucky that most of our students go above and beyond in their exploration of music, and strive for excellence in their comprehension of it.